Students gathered on Library Walk last Tuesday to demonstrate against the pro-Trump and anti-immigrant statements found written in chalk across campus on April 8. The event, titled Chalk Back, began at 11 a.m. when students gathered in front of the Silent Tree. For three hours, organizers encouraged students to voice their thoughts and feelings about the statements and the administration’s response to racial incidents in general. Toward the end of the event, faculty members, including Professor Dennis Childs and Professor Rosaura Sanchez, joined the students and voiced support for their cause. 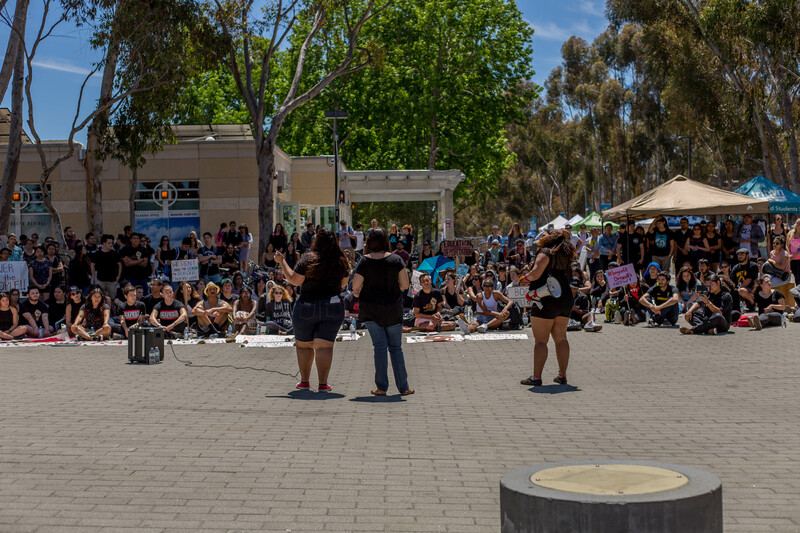 At the demonstration, student representatives from Movimeniento Estudiantil [email protected] de Aztlan and Migrant Rights Awareness announced that they had a list of 33 demands that students sent to UCSD administration before inviting them to the day’s protest. Eleanor Roosevelt College junior and MiRA representative Sonia Garcia Avelar told the UCSD Guardian that the demands are based on the collective needs of underrepresented groups and are within the scope of the administration’s power. Garcia Avelar also emphasized that, though MEChA and MiRA hosted the meeting to draft the demands and the demonstration, over 200 students from various groups on campus contributed significantly to the process. The incident in question is part of a larger event that is known as “The Chalkening” during which university students across the country used chalk to write slogans in public areas endorsing Republican presidential candidate Donald Trump. 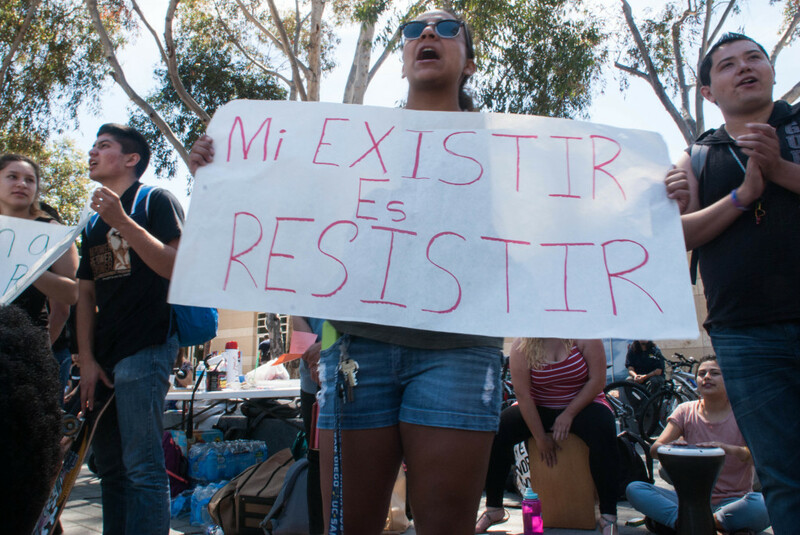 In addition to these political statements, antagonistic messages directed towards the Latinx, Chicanx and undocumented communities were found written around campus, including in front of UCSD’s Raza Resource Centro. Administrators did not respond to the chalking incident until five days later with a brief email denouncing the content of the messages, stating that the chalkings “[ran] counter to [the] campus values of equity and inclusion.” The emails then went on to reaffirm the university’s commitment to upholding principles of diversity. Sixth College senior and MEChA co-chair Aimee Nava told the Guardian that she was dissatisfied that the email was sent to faculty and staff before it was sent to students and that the university’s response to the chalkings is insufficient. Nava also emphasized that the protest was to call attention to the fact that administration does not appropriately address incidents of racism. The “Compton Cookout” is an event that occurred in February 2010, where one of the campus fraternities encouraged students to dress “ghetto” and eat watermelon as a means of mocking Black History Month. Later that same year, a pillowcase was found on the head of the Dr. Seuss statue resembling the hood of a klan member and a noose was found in Geisel Library. In response to these events, UCSD established the Diversity, Equity and Inclusion requirement in 2011. 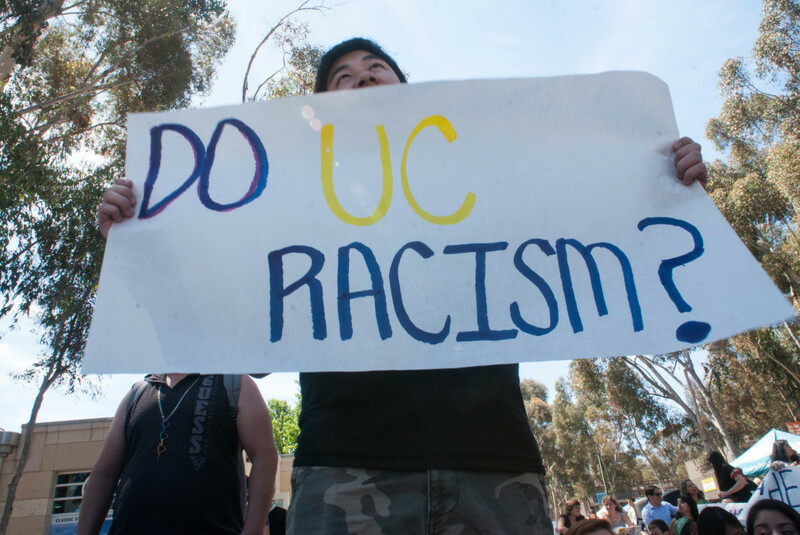 Muir junior and MEChA co-chair Elizabeth Uribe believes that the university should meet with representatives from all of the communities affected by incidents of racism all at once, rather than separately. Absurd. Since when is a university campus a sanctuary from the law? Demands? Gimme a break. Why did you feel the need to insert so many clarifications into the student’s quotes? Why not let the true quotes stand? Everyone supports LEGAL migrants and LEGAL migration! The problems with illegal migrants is that our emergency rooms are constantly full with them (I am a nurse so I know), the tremendous harm to our children’s education (my wife is a school teacher so she knows), the welfare costs (my nephew is a social worker so he knows), the destruction of middle class jobs (I worked in construction for 20 years so I know this too), the increased gangs/drugs/crime (my cousin was a police chief so he knows), and so many neighborhoods being destroyed (I lived in a poor one and watched it turn into an illegal migrant, gang infested, drug hole over the course of 15 years; and until any of these corrupt politicians living in their gated communities experience something like that, their rhetoric means less than zero to me). Despite misleading info and cherry-picked statistics by illegal migrant supporters (exploiters and sympathizers), that’s the reality where the rubber meets the road! If the epic fail politicians had listened to their constituents, rather than all of the wealthy exploiters, and done something to stop illegal immigration when it started in earnest back in the 1960s, we wouldn’t have this problem. We would have more legal, middle class immigrants strengthening our working class and contributing to our society instead! If you are anything but Native American, Indigenous to the Americas, you are a descendant of illegal immigrants, exploiters, thieves, and murderers. Illegal immigration has been an issue since the U.S.A was founded. Corruption, drugs and gangs are a part of its history and have spread to even the most honest neighborhoods like cancer. Corporate greed, corrupt politicians ( who mind you are at the source of drug importation), marginalization of low income communities are to blame for what you saw in your neighborhood, and what we have seen in ours. Our very own government is responsible for the drug problem in America. The U.S. is the largest consumer of of drugs in the entire world! Why does it come through Mexico? Mind you, it also comes through our ports and Northern sister country Canada, but because it is the physical border of this country where the most grotesque form of corruption between both governments exists. You can’t knock a person for wanting to make a living to feed their families and realize the commercialized American Dream, regardless of their legal status. Do not allow yourselves to be fogged by the reality of our nation’s corrupt state. I love the freedom we have, but the oppression, greed and xenophobia needs to be addressed and understood for what it really is. Love thy neighbor. Every human deserves food, clothing, shelter, and a means by which to be able to self sustain. I was a contractor for 20 years but decided to get a degree and pursue a different career because all of my competitors had nothing but illegal immigrants working for them on the cheap. I wasn’t willing to hire illegals to compete and it is a dirty shame that a couple of my former employees are now living in homeless shelters. 90% of the cocaine in America comes through our southern border; 80% of the meth and heroin in America also comes through our southern border! If you think Trump, who continually says “I love Mexican people,” is a xenophobe because he wants to secure our southern border, you might be a gullible fool subject to exploiter-funded media influence. Trump’s negative comments were targeted at a subset of illegal immigrants (which he has clarified many times); NOT Mexicans! Illegal immigration is destroying our society (illegal immigrant children are almost always below grade level so teachers have to spend most of their time teaching at that level, which hurts our children; illegal immigration keeps wages low; and the drugs from south of our border are ruining our children’s lives).